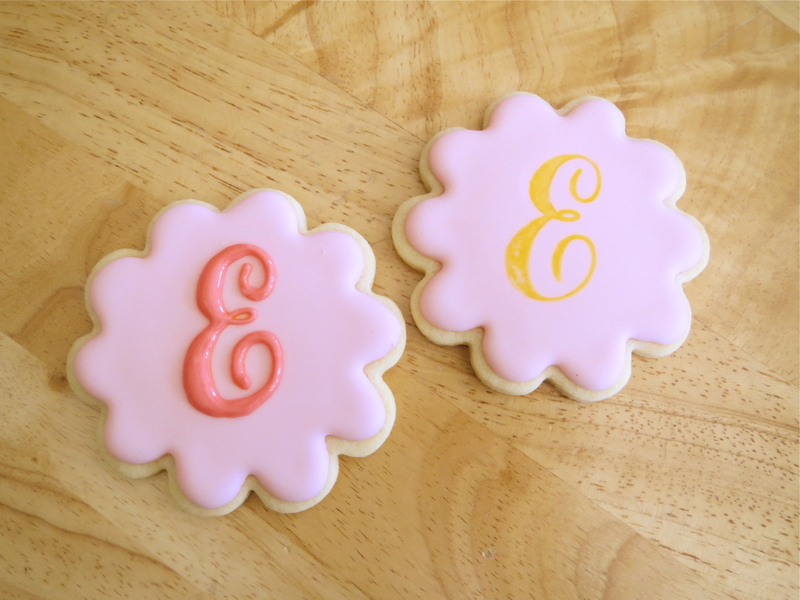 Piping letters on cookies scares the heck out of me. I avoid doing it, if I can, but sometimes it must be done. I suppose the more I attempt frosting words, the better I get. Practice makes perfect-ish! But really, I think all of my lettering looks the same, so once and a while it’s nice to do a different font. That is when I grab my stamps, cheater style. 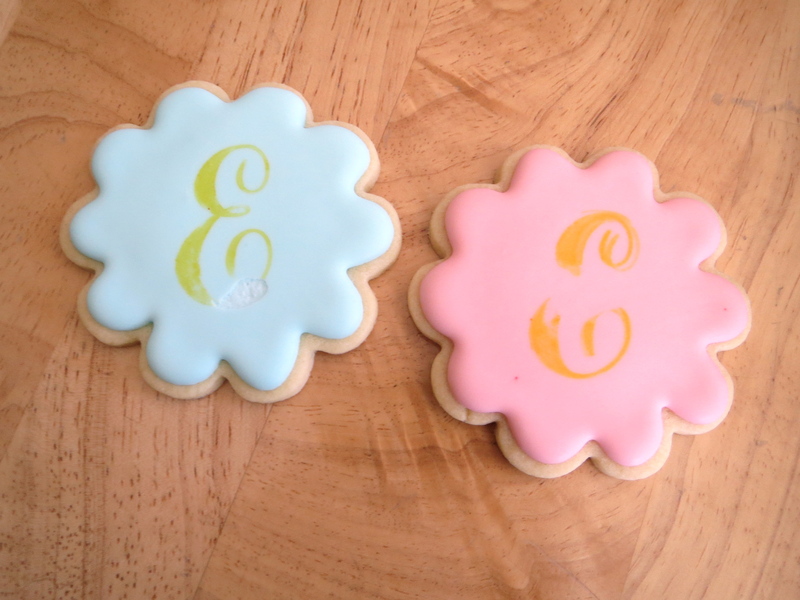 I was asked to make baptism cookies last month, some frosted with the letter “E”. Lo and behold, the clearance section held the perfect script to do so! Here’s how I did it, in case you’d like to give it a go. I frosted the base of the cookies and let them dry over night. The next day, I colored the rubber stamp with my trusty food writer. I chose yellow, thinking it would be the least conspicuous to frost over. Lining up it up to the best of my caffeine buzzed ability that AM, I stamped away to the 2 dozen lovelies in front of me. So you should know that not all of them came out perfectly. I pushed a little too hard on this blue one and the frosting stuck to the stamp, while the pink one shows it wasn’t quite level. No worries. Just wing it in the next step to cover up those boo-boos! Simply follow your markings to frost over the stamped part. Add a few embellishments, and TA DA! 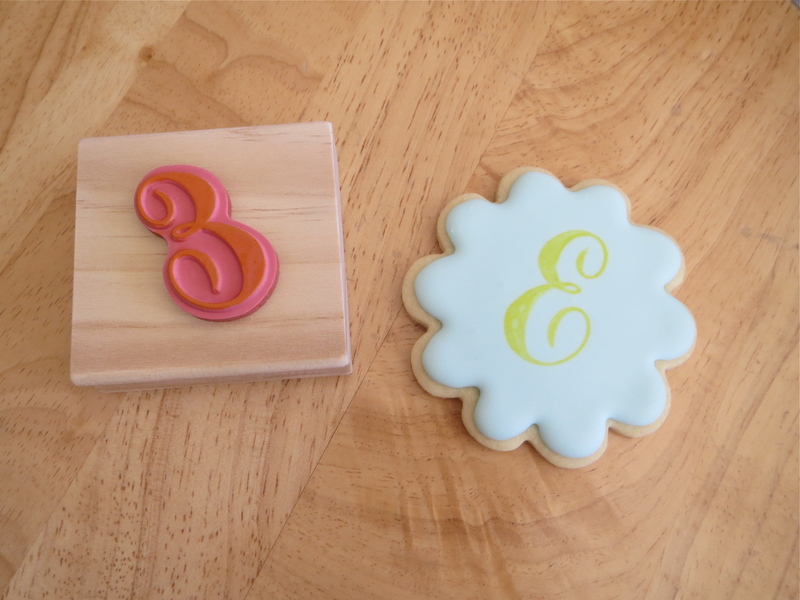 Pretty monogram cookies with not a lot of fuss. Keep your eyes peeled in the stamp isle. 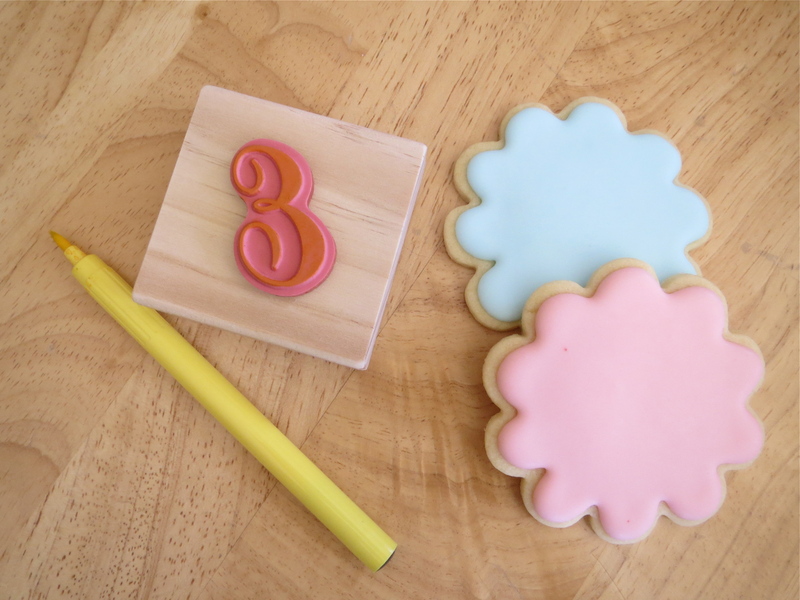 You never know what you’ll find there to use on a cookie, of all places. 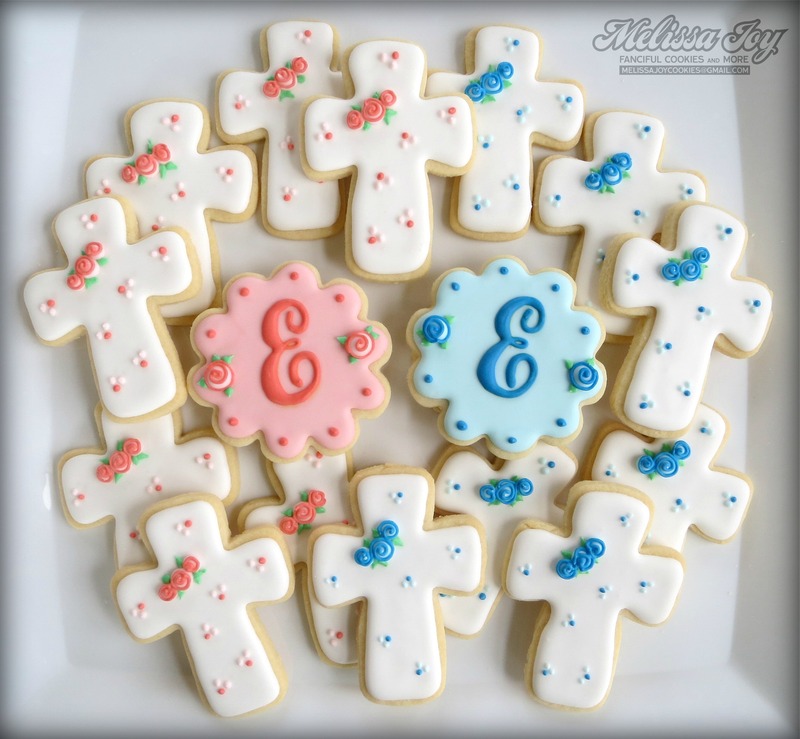 This entry was posted in Baptism Cookies, Cookie Tutorials and tagged baptism cookies, cross cookies, frosting lettering on cookies, monogram cookies. Bookmark the permalink. This is such a great idea, especially because you don’t have to haul out the KK! I should be on the look out for some single letter script stamps! Where did you happen to find the E stamp you used? Great baptism set BTW!! These are so gorgeous! 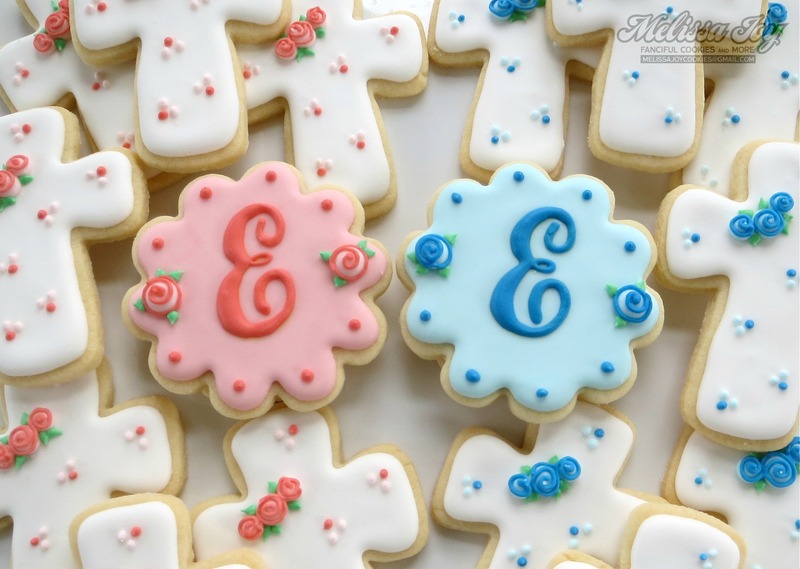 I wish I’d had them for my little “E” twelve years ago;) Great tutorial too! There is some controversy about using rubber stamps and the fact that they aren’t food safe. I’d been using them for a while before I read this thread (below.) I dunno – I’m sort of in the “That seems silly to me” group, but I figured I’d point it out so you can decide for yourself! This is really interesting and had not heard that before about the stamps. I think it is totally ridiculous, but understand there would be some concern that rubber stamps are not “legally” food safe. Guess I don’t trust the legality of things too much, with all the chemicals they spray on our fruits and veggies they deem as “safe” for us to consume! That said, I would LOVE for someone to come up with natural food dyes for my frosting. Seems a shame to use organic ingredients in the cookies and then add the dyes to the frosting. I just tell myself that at least it’s just a tiny bit! Thanks for commenting, Angie! Such a GREAT idea Melissa! Looks like you used royal frosting for the base. What type frosting did you use for the letter? Hi Rachael! It’s all royal icing!